IR LED emits infrared light, and used in TV remotes. This Infrared is received by the receiver TSOP17XX (TSOP 1738used in TV). TSOP17XX receives the modulated Infrared waves and changes its output. TSOP is available in many frequency ranges like TSOP1730, TSOP1738, TSOP1740 etc. Last two digits represent the frequency (in Khz) of modulated IR rays, on which TSOP responds. Like for example TSOP1738 reacts when it receives the IR radiation modulated at 38Khz. TSOP output is active low, means it becomes LOW when IR is detected. In this remote controlled switch circuit we are using TV remote to ON/OFF the AC light by pressing any button of remote, and using the TSOP1738 at receiver end. 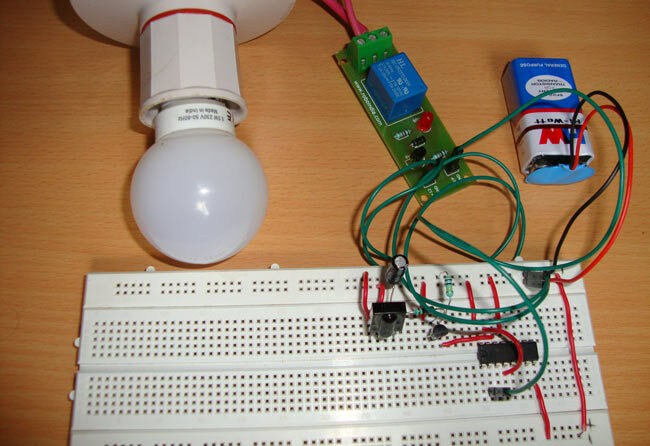 Receiver circuit is connected to AC appliance via Relay, so that we can control the light remotely. We have used IC 4017 to convert it into a push ON, push OFF switch. Go through this article to understand the IR Transmitter and Receiver. Normally when we press any button of TV/DVD player remote, Light glows and as soon as we release Button, it becomes OFF. Now it can be converted into a PUSH ON and PUSH OFF toggle switch using IC CD4017. IC CD4017 is a CMOS decade counter IC. It can produce output at the 10 pins sequentially, i.e. it produces output one by one at the 10 output pins. Output is switched to one pin to another by applying a clock pulse at pin 14. Learn more about IC 4017 here. When firstly, power is applied to IC 4017, output at PIN 3 (Q0) is HIGH, when we press the button of IR remote, then a LOW to HIGH clock pulse is applied to PIN 14 (first clock pulse) and output at Q0 becomes low and PIN 2(Q1) becomes HIGH. PIN 2 triggers the RELAY module, and the AC light becomes ON. Now this position will remain until the next clock pulse. If we press the Button of IR remote again (second clock pulse), output at Q1 becomes LOW and Q2 becomes HIGH. This will deactivate the Relay and switch off the light. And because Q2 is connected to the RESET pin 15 of 4017, it will reset the IC and again output at Q0 becomes HIGH and Q2 becomes LOW (initial state). So it works like a toggle switch. Output of TSOP1738 oscillates at the rate of 38KHz, which is applied to clock pulse of 4017. So we have connected a 1uF capacitor across the output of the TSOP so that this 38KHz pulse train is counted as one clock pulse to the IC 4017. We can also use the IR transmitter circuit to ON/OFF the Bulb, this IR transmitter circuit produces modulated IR at 38KHz like a TV remote. Also we can replace Bulb with any AC appliance, which is to be controlled by remote control. The circuit worked with me well i applied it to 12v dc led back up system but the problem is the circuit disturbed by outer frequencies for example when i turn on a CFL light the circuit start on and of several time before it stabilized again .so ho i could make the sensitivity of the circuit less. Try to use bandpass filter with the Receiver part. Should the bandpass filter connected to the output of TSOP1738 then the rest of the circuit is the same and what range of frequencies you suggest to work with . Yes, rest of the circuit will be same. Band pass filter should work well and TSOP output shouldn't get disturbed by other frequencies other than 38KHz. Using Band pass filter either is hard or not cost effective, the passive band filter is hard to be constructed since its very difficult to find the predetermined values for capacitors for example in L-C circuit while using active filter such LM741 circuits need more space and need 2 IC's to construct the circuit - Those most of circuits i found on the Internet - one of the solution discussed is using LM567 IC with the CD 4017 so the circuit of IR remote switch will need little modification. I will be very grateful if you kindly give me your opinion and if possible i need your help to re-modify the schematic withe LM567 solution if its appropriate. Hi Madox, If you look at the datasheet of TSOP17XX, it have all the circuitry to avoid the disturbance, like Bandpass filter, AGC etc. This circuit is working fine for me, you can also use a RC circuit at the clock PIN of 4017 to avoid the unexpected results, generated while pressing remote button. RC circuit at clock pin has been also used in this Circuit. Hi Maddy, can you send me the Simulation of this circuit ??? Can i use 2138 sensor? Because it could not work. Please help on this issue. yes, you should use another 555 timer in monostable mode, in place of 4017 IC. Remove the BC557 transistor and connect the Trigger PIN to the 10k resistor at the OUT pin of TSOP. Hi Jayant can you send me the Software Simulation of the above circuit ??? Can you please specify what is the min-max operating distance range for this circuit? In case i need to place the receiver circuit on the wall, can I be able to operate from a distance of 10 feet etc? I test the circuit and it worked on 8M which is about 26 feet , and i think it will work on more distance . the distance the receiver can operate with is based on the signal strength of your transmitter device. sir i hv made the circuit till the led on pin 2 but i have not connected the relay,,,but the led is not stable,,it is on for the moment i press the switch and it goes off when i release the switch...what could be the problem????? Could you please tell me what is the voltage of the 1 microfarad capacitor? Will there be no reverse voltage from the capacitor? That is, the capacitor's positive voltage cannot travel to the output pin of the TSOP receiver? Thank you for this clear and easy explanation, I have a question. Is there anyway to translate signals come from many buttons in the remote control to switch multiple outputs ? Subscription box is given at the bottom of every page, just enter your Email address and hit Subscribe button. 1. The 9v Battery - What possible other could be to forego the battery how can i give it a alternate source? 2. IC 4017 - can i use something else other than the IC 4017, the main reason to not use is the Space it uses! Can i use a 555 instead ? Try using 3v Button cells. You can use 555 as a Switch instead of 4017. Switching ON time is not related to the AC load in any way, whether you connect TV or a Zero wall bulb. Check that your components are not faulty, also check your connections again. Can I use IC 7408 with this? which remote works the best? You have probably reversed the connection for NO and NC in Relay, means you have connected NC in place of NO and vice versa. I made this circuit but it is not working!!! the cathode end of the diode is given +9v supply, that means the diode is reverse biased?? can anybody explain me this part? can anybody tell me the sequence of the circuit.?? Every Inductor coil produces equal and opposite EMF when switched OFF suddenly, this may cause permanent damage to components, so Diode must be used to prevent reverse current. Hi,the TSOP1738 output goes to the base of the pnp transistor,but why the collector is wired to the positive rail,it should be an npn transistor. 1uF, 50v you can use any normal 1uF capacitor. Sir i dont understan the 4th pin of the ic 4017 goes to 15 MR where is the 15th pin and what is MR?please explain me sir iam new to this field thank u sir. I'm facing unstable output of tsop 1738. It is not stable. What should i do. i made above circuit but not working.......used hs0038 instead of tsop1738.......anybody help me? I want to control two numbers of electrical devices. Please tell me the procedure as soon as possible. You can connect both the devices in parallel to this circuit. Both will turn on on first button-click and then turn-off on second click. Jayant - pls let me know what is the output voltage/amperage of this whole circuit. I am asking to know if we can control any AC/DC device (9V DC or 240V AC) and current ranging from 1A to 16A ?? Yes we can control any device, just we need to choose Relay of proper rating. Hi to Everyone, can somebody help me with the explanation about how can I use IR Remote to control lights? Can we connect more than 1 bulb ? If yes then how? As we to built a project based on this so we r trying to make it using 230v 50 hz supply so shall we use a rectifier/filter and transformer before this circuit to make it work on 230 v 50 hz supply...??? Ans fast as it is an urgent need..?? Can relay be activated with 4 volts? How long can battery last in this circuit? I want to use both mechanical switch and remote switch(by remote) together, can you suggest me circuit for that ? Sounds odd... Is your circuit correct? If yes, try changing the TSOP, yours might be a faulty one. I am having a problem with the circuit. It stays switched ON for couple of seconds and switches OFF by its self. I have covered all the points discussed but still the problem exists. Can any one give me a tip to over come this problem and also to make a robust circuit which works without any hitch.